Som Tam Nua - Bangkok's Best Som Tam? 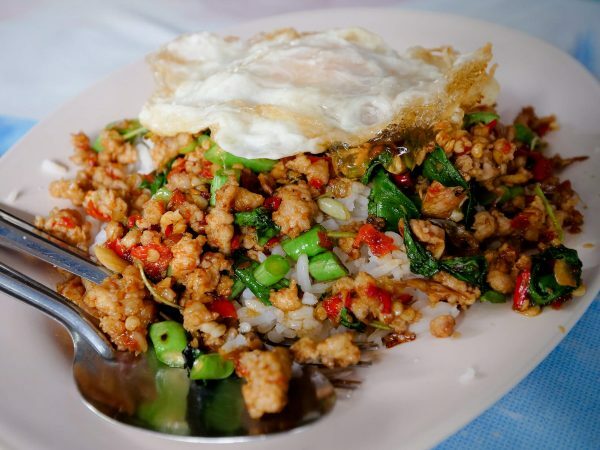 Som Tam Nua – Bangkok’s Best Som Tam? 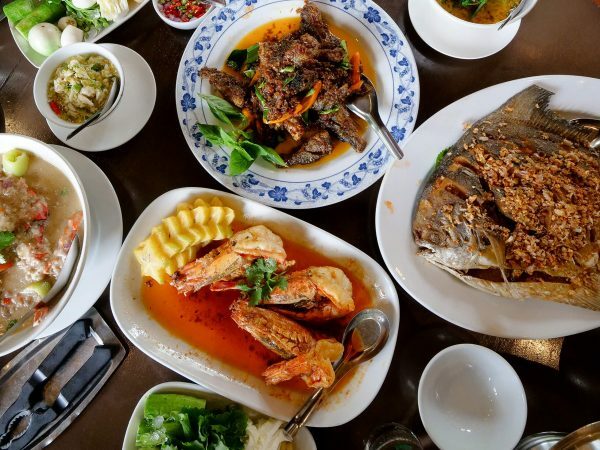 Having received plenty of praise, including a “best som tam” in Bangkok award from CNNGo.com, Som Tam Nua is a very famous Thai Isaan restaurant in Siam, Bangkok. 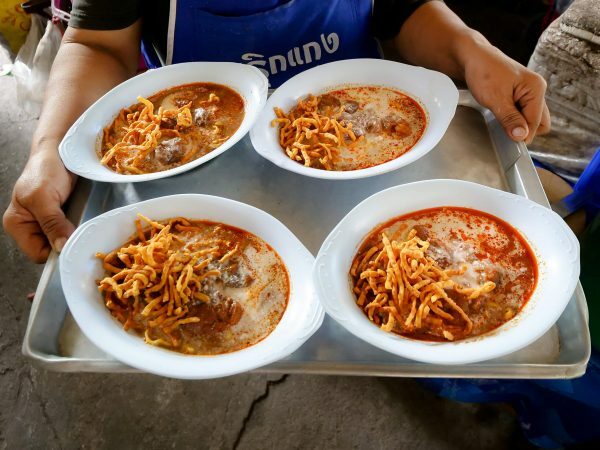 I had never eaten there until a few weeks ago, I was on assignment to make a video about some of the top things to do in Siam, and wanted to includ Som Tam Nua in that video. 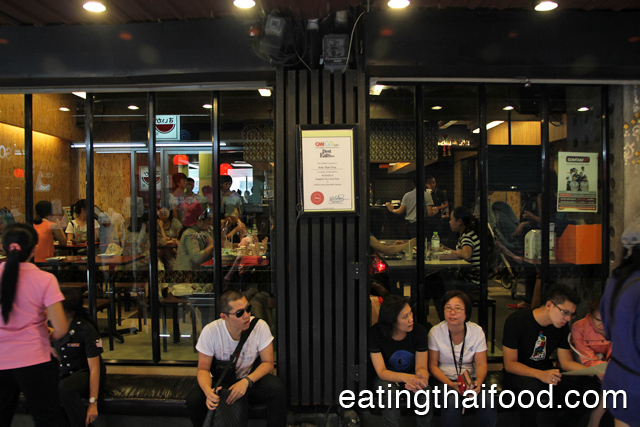 Som Tam Nua is a restaurant where people line up outside, waiting their turn for seats. Luckily the day we went, we waited just five minutes before entering. First up (pictured above) was a bowl of tom saap kraduk moo on (ต้มแซบกระดูกหมูอ่อน), sour Isaan soup filled with meaty pork bones. It was nice and sour as it should be, quite spicy, and the bones had plenty of tender pork still on them. Very good tom saap! 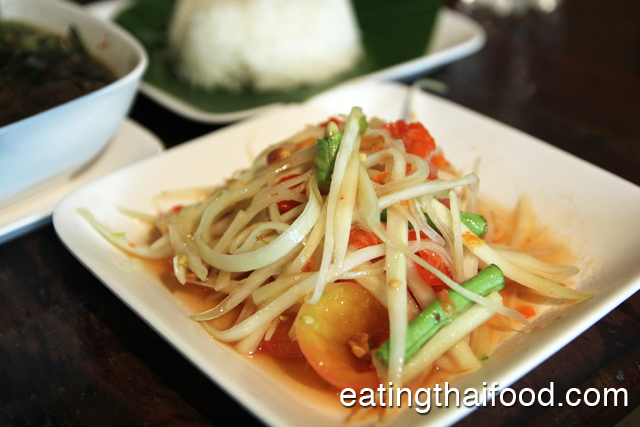 For our first dish of som tam, we ordered their normal som tam Thai (ส้มตำไทย). So does Som Tam Nua have the best in Bangkok? It was mildly spicy, nicely sour, but a little too sweet. It was alright, but not the best som tam I’ve had. The latter dish, som tam muah, which you’ll see below, was excellent. The ingredients in the som tam though, were very fresh and the papaya was crisp. Seeing larb pla tod (ลาบปลาทอด) on the menu, I couldn’t resist. 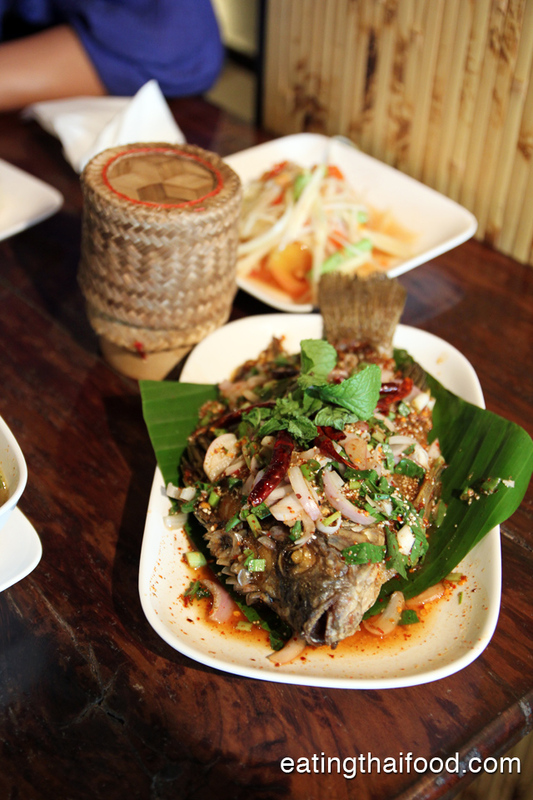 It was a little tilapia deep fried to a crisp and topped with a good selection of larb ingredients like red onions, herbs, chilies, and mint leaves. The dressing included lime juice and fish sauce, chili flakes and toasted rice. It was pretty good, nicely sour from lime juice, but perhaps a bit too salty. Good, but not compared to the nam tok pla tod at Som Tam Boo Maa. 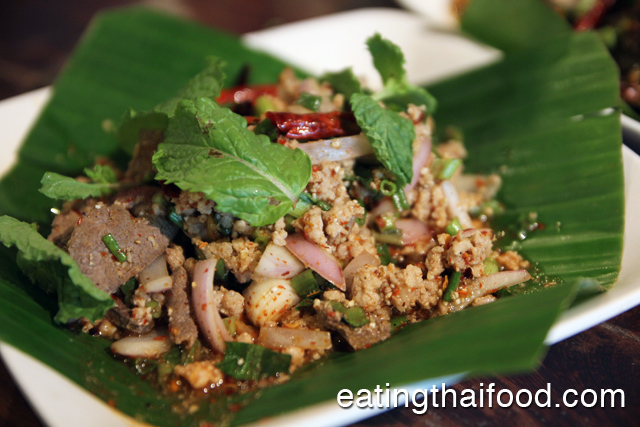 I also sampled their normal larb moo (ลาบหมู). It was a nice mixture including some lovely chunks of liver and nice chunks of red onions. I also love the whole dry chilies. Last, but not least was tam muah (ตำมั่ว), a mix salad including a bit of everything. This was the winning dish for me, the dish I would come back to again for! Kanom jeen noodles, green papaya, tomatoes, eggplant, and fried pork skins were the main ingredients. The dressing included fish sauce, lime juice, and a perfect amount of fermented fish sauce (pla raa). It was quite spicy and had some wonderful flavor to it. Well, I’ve definitely had better normal som tam at other restaurants, but overall the food at Som Tam Nua (ส้มตำนัว สยามสแควร์) was very decent. I’ve read about a few others that said the flavors were toned down to cater to foreigner tastes, but that was not the case for our meal. Everything, apart from the som tam Thai, was very sour and quite spicy – on the spicier and more sour side of average Thai. I was very pleased. By far my favorite dish was tam muah (ตำมั่ว), the mixed salad (but only order this if you enjoy fermented fish). 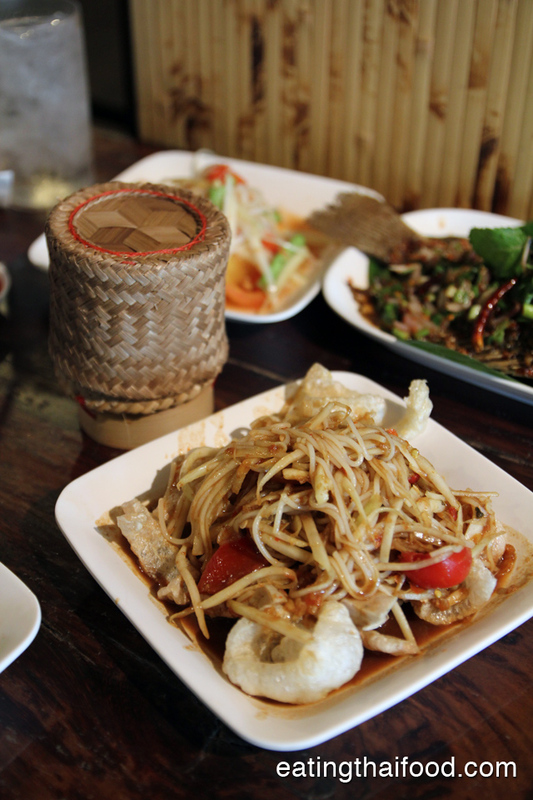 If you’re in Siam and looking for good Isaan food, Som Tam Nua is a good choice. It’s always packed full of Thais. Also, if I went back, I’d order their fried chicken, it looks amazing! 21 comments. I'd love to hear from you! Mark, where can i have the best som tam in bangkok then ? Thanks for the rec, went tonight and enjoyed it. Hey Jay, glad you enjoyed it! Hi Mark, chanced upon your website. Thanks for sharing. Would love to agree with you on the food but sadly, my family and I found a finished cigarette in our tomyam soup at this outlet. Would never return to this place again. Hey Jasmine, wow that’s pretty terrible, sorry about that experience. Did you let the management know? Thank you so much for your reviews. We will be in Bangkok next week (finally after three long years of abstinence :) ) and I’ve spent more time with reading your blog and watching your videos, than with any other travel page or guide book. Definately will try Som Tam Nua and we’re also looking very much forward to visiting P’Aor and some other locations you recommend. Hey Dennis, great to hear from you and thank you for following. Have a fun time in Bangkok and enjoy the food! The best Som Tam I have had was at the Australian Pub on Soi 11, which is the place I least expected it. It was a large meal sized serving with fleshy grilled prawns through it, and while I asked for it “pet nid noi” it was pretty spicy. I am sure it would have been hotter if I hadn’t asked. Haha, good to hear that Scott! Closeby on Siam there is a lively and bright cafe-eatery place called Inter. 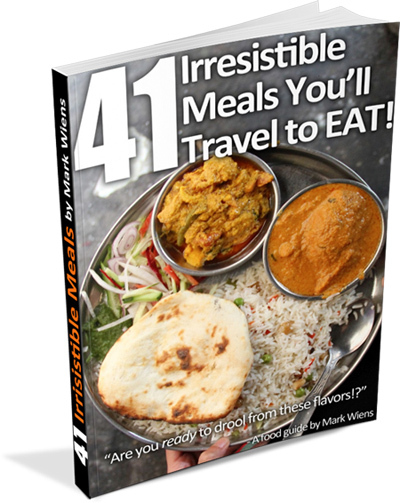 I go alone , with friends or with my kids who eat like horses. Extensive menu, cold beer, quick service from attentive girlies who seem amused at my lack of Thai. Preferable to Ban Kuhn Mae which is more upmarket and pricey. Usually pretty full but no wait for a table. Try it out Mark if u havent already. Great, thanks for the suggestion Mark. I’ve never been there, but will if I’m in the area next time! Thanks for sharing Frans, that’s exactly what I thought.. but I was disappointed that I didn’t order any other their fried chicken! I LOVE when they put liver and other bits of offal in larb. Americans don’t know what they’re missing when they throw that stuff away in any dish. I agree Larry, so good! You’re welcome Finiaco, thanks for checking it out!